This magnificent all brass monocular microscope made by hand by Leitz of Wetzlar, Germany, represents the first Leitz microscope replica ever produced and is identical in every way to the original Leitz stand IV microscope manufactured in 1899 by Ernst Leitz in Wetzlar, Germany. An identical copy of the original, the replica was produced in the 1970s and includes Leitz quality optics, an engraved set of accessories, a mahogany wood case, and a Plexiglas viewing case with wood base. The accessories include 2 interchangeable oculars, 3 handmade objectives with individual brass cases (i.e., 1x, 3x, 5x), and a set of 5 slide-mounted specimens. 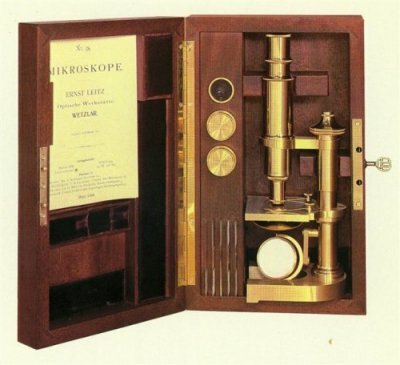 A facsimile booklet detailing the original microscope and taken from the original Leitz catalogue dated 1899 completes the exclusive total equipment. This is not a toy but an original working microscope intended to be used and not abused. In every sense of the word, this is for a collector and represents a showcase piece. Limited edition of 1,000 with the one offered here as #461. Perfect original condition. Price is the original issue price and includes shipping within the Continental United States.